Indulge yourself and your most delicate areas with this incredibly smooth and satiny hypoallergenic lubricant for sensitive skin. The luxurious Glycerin and Paraben Free formula is specifically designed for sensitive skin to heighten sensation & arouse satisfaction. Enhanced with skin nurturing Aloe & Olive extracts as well as Vitamin E. Aqua Sensitive will caress to new levels of pleasure. Apply a small amount of Aqua Sensitive where lubrication is desired. Re-apply as necessary. Cleans away easily with water. 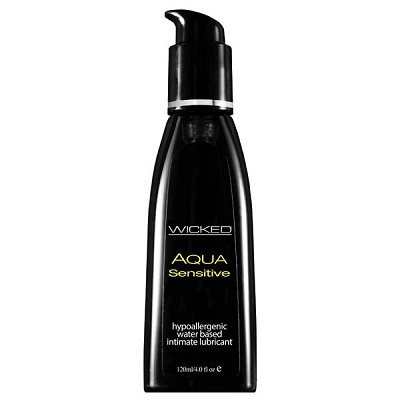 Water Based Lubricant – 120 ml.